“People serving here don’t do it for the money,” said Jeff White, the ebullient Program Administrator of the Rose Park Senior Activity Center during our tour in March of 2014. There is sometimes some, “stress in the food line” at the center he says, and the above staff members handle it with grace. We heard about karaoke on Tuesday nights — an activity that has developed a “huge” following. White said they’ve expanded the offering a couple times because of so much interest. 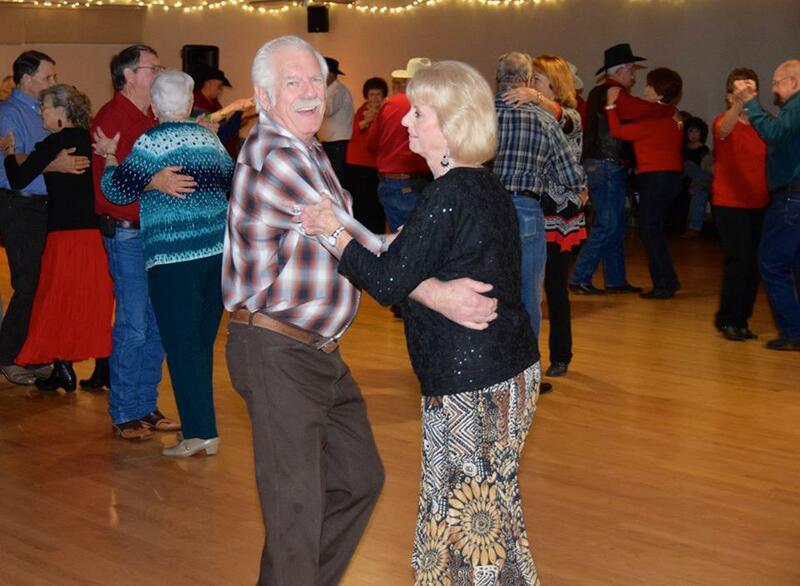 Then on Thursday evenings are the popular dances with bands playing live music. Muddy Creek was mentioned as a favorite group. We saw a nice pool room which was well-lit, and with attractive, decorated glass windows separating it from other sections of the center. While we were there, we also walked through a well-attended exercise class. The center reports seeing 400-500 folks a day, not including groups that also use the facility for meetings. Many classes are taught by seniors, such as the Sit & Fit class. Meals served at the senior center cost $290,000 per year. Approximately $60,000 in donations is received. Link to the City of Abilene Senior Citizens Services Division to find out more. Also see My Abilene Parks & Recreation on Facebook. When we first moved to Abilene I couldn’t imagine what the “little city” on S. 7th Street was all about. While driving by, I’d try and glance through the chain link fence to get a better look at the miniature stores and roads, complete with traffic signals and correct street markings. I wasn’t the only one in my City University class of several newcomers to be curious and perplexed about the facility before we got to see inside the fence. Other adults in the class who were born here however, still had special memories from childhood of the thrill of driving the streets in the little cars. Safety City also includes a “Fire Station” complete with a room where simulated smoke is piped-in. I felt rather claustrophobic in there. There is a baby doll to save, and a window that can be opened and climbed out of for practice. During the summer Safety City is open for groups to schedule tours. The cars are too small for some of today’s kids. Touring Adaptive Recreation was a highlight. The woman who runs it appeared very warm and loving, and we were greeted at the door of the aging facility with great and sincere enthusiasm by one of the participants named John. This little-known center (I think none of us had heard of it) provides games, activities and social opportunities for adults with mental and/or physical disabilities. They are housed in the tan brick building across from the senior center. Attendees learn life skills through a variety of fun-sounding classes like “Use Your Noodle,” “Manners Matter” and “Group Dance Battle.” Each month there are “Random Act of Kindness” awards and field trips. Ms. Barbara Liggett, Supervisor, said that it’s a great pleasure to see people develop independence. Some attendees coming in for the first time at an older age with very few skills have made great advances. It felt like a happy, fun, productive place. They welcome volunteers. Side Note: Upstairs in this building is a lovely, open room with big windows all around it, looking out over the park. The building was the original rec center at Rose Park and this upstairs area was used for parties and such then. Now the adaptive rec participants sometimes put on shows in the space. When we visited in March there were also practices going on for Spring Track & Field Special Olympics events. 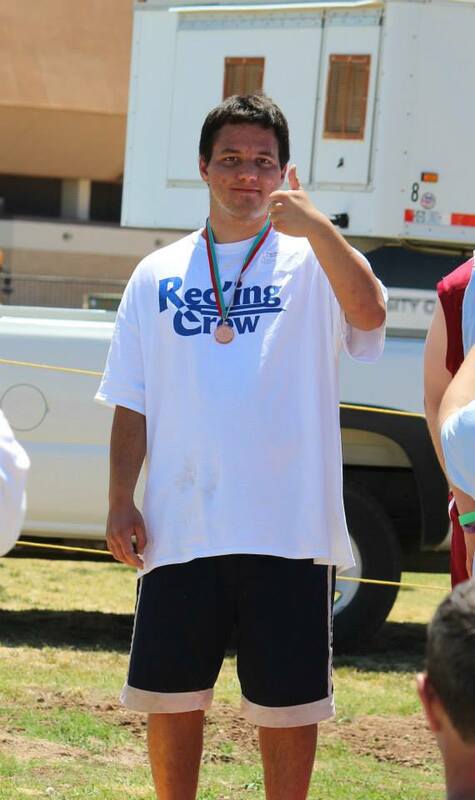 The “Rec’ing Crew” is the team which competes from the Adaptive Rec center. 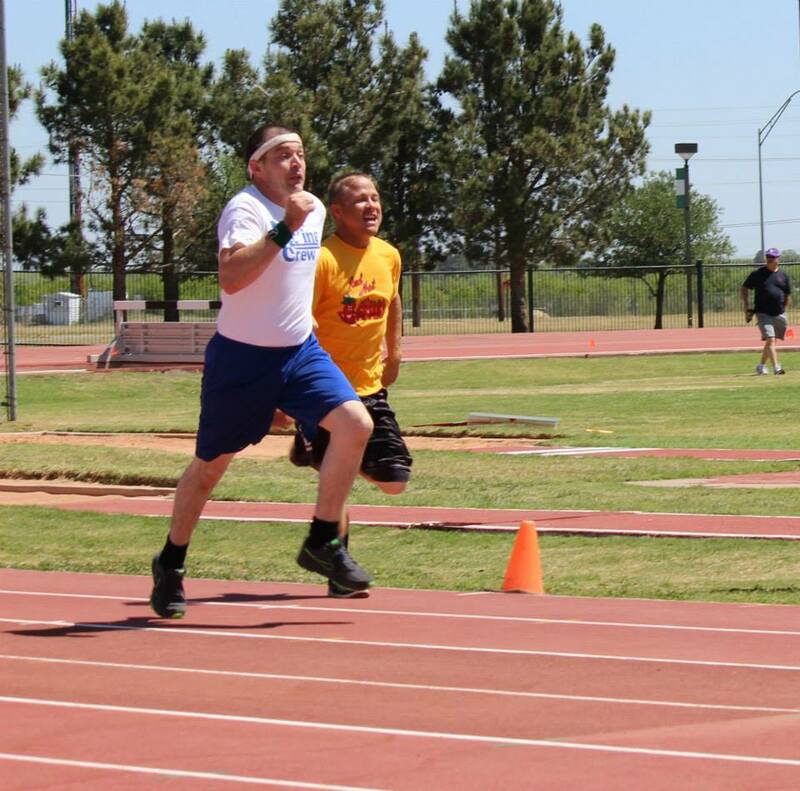 Rec’ing Crew Special Olympics Event at ACU – Photo Courtesy City of AbileneWhen we visited in March there were also practices for Special Olympics Track & Field events going on. In May of each year, “The Rec’ing Crew” from Abilene competes. 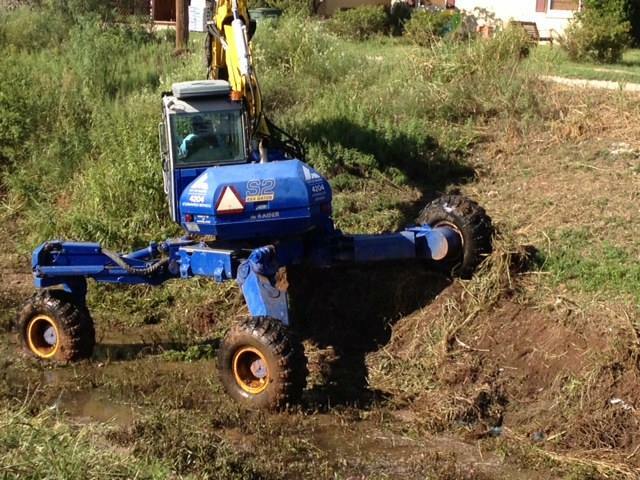 Beside a ditch out in the middle of Rose Park we saw this amazing machine in action. The Spider was utterly impressive and fascinating. Operating the complicated equipment requires special training, as there are a lot of moving parts. 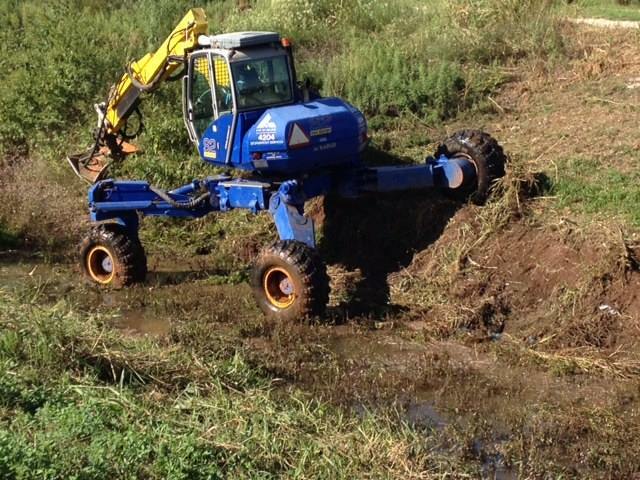 This expensive, specialized piece of equipment is used to clear ditches whose steep banks make it hard to get down into certain spots to remove debris. These areas can get choked with weeds and cause drainage problems. 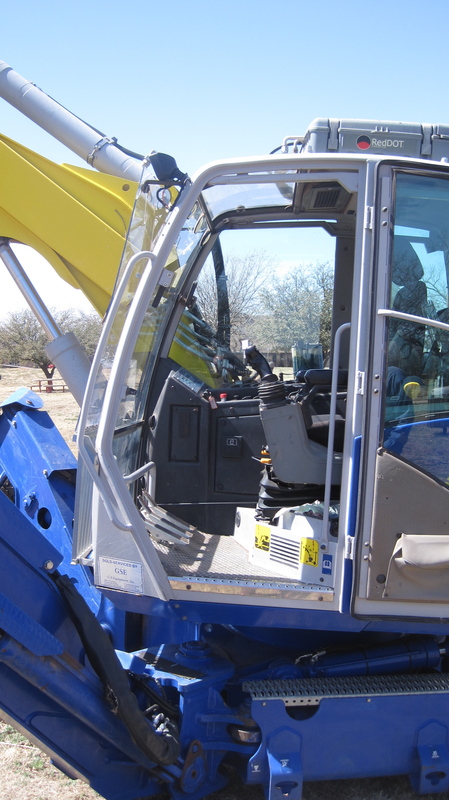 A view into the cab of The Spider – the Swedish-made mowing machine for accessing deep ditches. We also took a look at the tennis center at Rose Park.